TEMA's Mission is to coordinate preparedness, response, and recovery from man-made, natural, and technological hazards in a professional and efficient manner in concert with stakeholders. 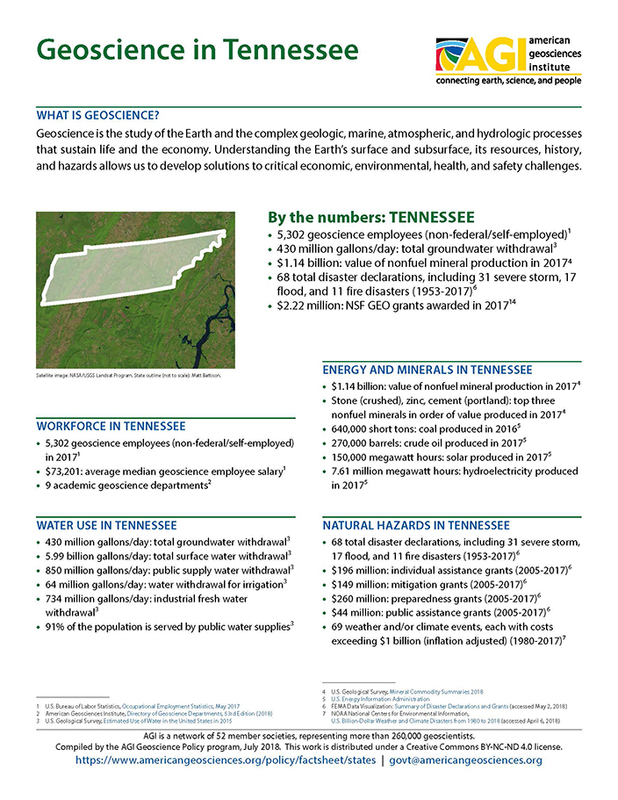 The mission of the Tennessee Geological Survey is to encourage and promote the prudent development and conservation of Tennessee’s geological, energy and mineral resources by developing and maintaining data bases, maps and technical services; providing accurate geologic hazard assessments; and disseminating geologic information through publications and educational materials. The 2014 Critical Issues Forum, entitled "America’s Increasing Reliance on Natural Gas: Benefits and Risks of a Methane Economy", examined the 5- to 30-year outlook for the development of a natural gas-dominant energy sector in North America and discussed the associated benefits and risks. The lectotype of Nucleospira concentrica Hall 1859 from the Brownsport formation (Silurian) of western Tennessee is reillustrated. This species was later made the genotype of Lissatrypoidea Boucot and Anisden 1958.